“The Society of Organizations” here — . save time and money, and boost morale. “For years, organizations have lavished time and money on improving the capabilities of managers and on nurturing new leaders. US companies alone spend almost $14 billion annually on leadership development. Colleges and universities offer hundreds of degree courses on leadership, and the cost of customized leadership-development offerings from a top business school can reach $150,000 a person. Moreover, when upward of 500 executives were asked to rank their top three human-capital priorities, leadership development was included as both a current and a future priority. Almost two-thirds of the respondents identified leadership development as their number-one concern. Tomorrow’s leader won’t be able to lead by charisma. He or she will need to think through the fundamentals so that other people can work productively. This will be quite demanding, especially considering the speed of change, the expectations of the new workforce, and an increasingly competitive world economy. But it will also be demanding because it is no longer adequate to have a policy and expect it to carry you through the years. Some companies, such as General Motors, AT&T, and Sears, have had success with long-term major policies. But they are the exceptions; the truth is that ten years is common. Now the changes are coming so fast that changes every three to four years will likely become commonplace. Increasingly, a CEO’s job will be much more like the most complex job I know, which is running an opera. You have your stars and you can’t give them orders; you have the supporting cast and the orchestra; you have the people who work behind the scenes; and you have your audience. Each group is completely different. But the opera conductor has a score, and everybody has the same score. In a business you have to make sure all the various groups converge to produce the desired result. This is the key to understanding what’s ahead. It’s not about being less or more important, but differently important. It’s not about refraining from giving orders—but knowing when to give an order and when to treat someone like a partner. And it is not, I assure you, about playing down financial objectives; on the contrary, our demographics tell us that this will become more important. But you will have to know how to integrate your financial objectives with the need to build and maintain a business. I’ve read and outlined all of Drucker’s management books and I don’t remember ever seeing this quotation. In fact the quotation is inconsistent with his published work. It is contradicted by some of the statements below. 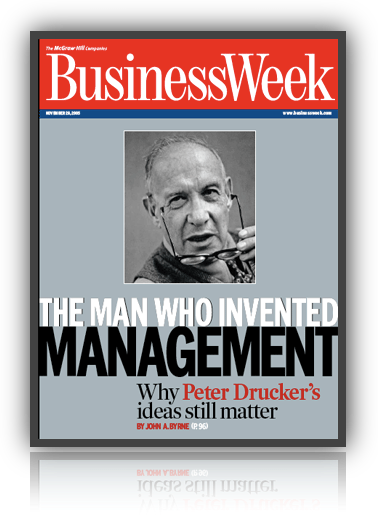 If Drucker really thought that leaders did the right thing, why didn’t he write a book on leadership? Rarely in human history has any institution emerged as quickly as management or had as great an impact so fast. In less than 150 years, management has transformed the social and economic fabric of the world’s developed countries. It has created a global economy and set new rules for countries that would participate in that economy as equals. And it has itself been transformed. “Leaders are not born, nor are they made — they are self-made. Effective executives differ widely in their personalities, strengths, weaknesses, values, and beliefs. The non-profit organization exists to bring about a change in individuals and in society. The first thing to talk about is what missions work and what missions don’t work, and how to define the mission. For the ultimate test is not the beauty of the mission statement. The ultimate test is right action. Sidebar by bobembry (site developer): Right action depends on an adequate foundation for future directed decisions. The most common question asked me by non-profit executives is: What are the qualities of a leader? The question seems to assume that leadership is something you can learn in a charm school. But it also assumes that leadership by itself is enough, that it’s an end. The leader who basically focuses on himself or herself is going to mislead. What matters is not the leader’s charisma. What matters is the leader’s mission. Therefore, the first job of the leader is to think through and define the mission of the institution. Leadership is all the rage just now. “We’d want you to run a seminar for us on how one acquires charisma,” the human resources VP of a big bank said to me on the telephone—in dead earnest. 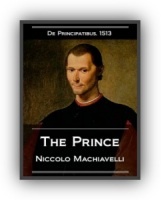 Books, articles, and conferences on leadership and on the “qualities” of the leader abound. Every CEO, it seems, has to be made to look like a dashing Confederate cavalry general or a boardroom Elvis Presley. Leadership does matter, of course. But, alas, it is something different from what is now touted under this label. It is mundane, unromantic and boring. The goal is results and performance that fulfills a clearly stated mission—something that needs doing—something that creates value for a customer (something that is important to them as human beings—not the typical marketing BS but real marketing). … In the first place, leadership is not by itself good or desirable. Leadership to what end is thus the crucial question. History knows no more charismatic leaders than this century’s triad of Stalin, Hitler, and Mao—the misleaders who inflicted as much evil and suffering on humanity as have ever been recorded. The second requirement is that the leader see leadership as responsibility rather than as rank and privilege. 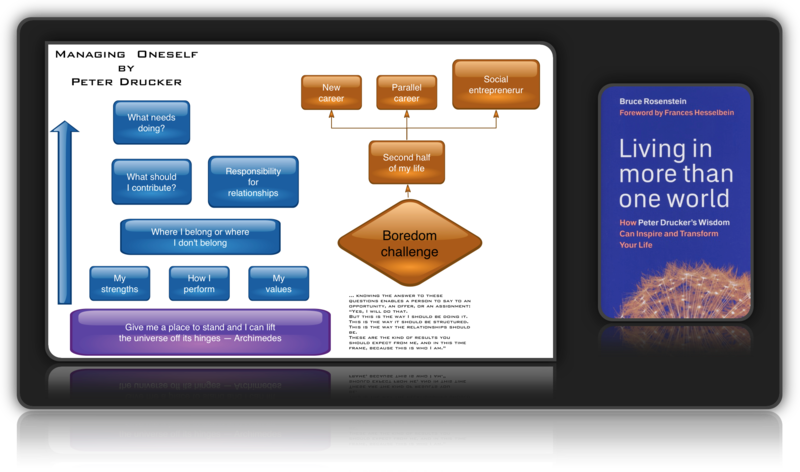 According to Peter Drucker, "Leaders in every single institution and in every single sector … have two responsibilities. 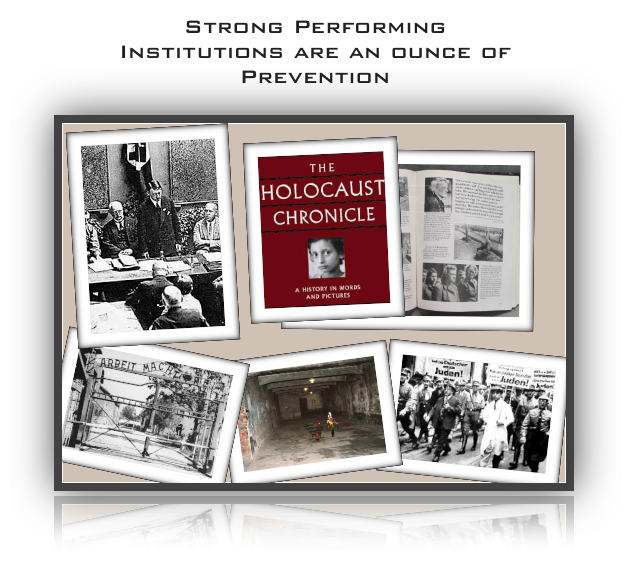 They are responsible and accountable for the performance of their institutions, and that requires them and their institutions to be concentrated, focused, limited. They are responsible also, however, for the community as a whole." for constantly pushing back the limitations of economic circumstances on the enterprise’s ability to contribute. The final requirement of effective leadership is to earn trust. Otherwise there won’t be any followers—and the only definition of a leader is someone who has followers. To trust a leader, it is not necessary to like him. Nor is it necessary to agree with him. Trust is the conviction that the leader means what he says. A leader’s actions and a leader’s professed beliefs must be congruent, or at least compatible. After I had said these things on the telephone to the bank’s human-resources VP, there was a long silence. I have been working with organizations of all kinds for fifty years or more — as a teacher and administrator in the university, as a consultant to corporations, as a board member, as a volunteer. Over the years, I have discussed with scores — perhaps even hundreds — of leaders their roles, their goals, and their performance. I have worked with manufacturing giants and tiny firms, with organizations that span the world and others that work with severely handicapped children in one small town. I have worked with some exceedingly bright executives and a few dummies, with people who talk a good deal about leadership and others who apparently never even think of themselves as leaders and who rarely, if ever, talk about leadership. The first is that there may be “born leaders,” but there surely are far too few to depend on them. Leadership must be learned and can be learned — and this, of course, is what this book was written for and should be used for. But the second major lesson is that “leadership personality,” “leadership style,” and “leadership traits” do not exist. Among the most effective leaders I have encountered and worked with in a half century, some locked themselves into their office and others were ultragregarious. Some (though not many) were “nice guys” and others were stern disciplinarians. Some were quick and impulsive; others studied and studied again and then took forever to come to a decision. Some were warm and instantly “simpatico”; others remained aloof even after years of working closely with others, not only with outsiders like me but with the people within their own organization. Some immediately spoke of their family; others never mentioned anything apart from the task in hand. Some leaders were excruciatingly vain — and it did not affect their performance (as his spectacular vanity did not affect General Douglas MacArthur’s performance until the very end of his career). Some were self-effacing to a fault — and again it did not affect their performance as leaders (as it did not affect the performance of General George Marshall or Harry Truman). Some were as austere in their private lives as a hermit in the desert; others were ostentatious and pleasure-loving and whooped it up at every opportunity. Some were good listeners, but among the most effective leaders I have worked with were also a few loners who listened only to their own inner voice. The one and only personality trait the effective ones I have encountered did have in common was something they did not have: they had little or no “charisma” and little use either for the term or for what it signifies. 1. The only definition of a leader is someone who has followers. Both roles are important and badly needed. But without followers, there can be no leaders. 2. An effective leader is not someone who is loved or admired. He or she is someone whose followers do the right things. 3. Leaders are highly visible. 4. Leadership is not rank, privileges, titles, or money. This has to be something that both needs to be done and fits the leader’s strengths and the way she or he is most effective. 3. They constantly asked, “What are the organization’s mission and goals? 4. They were extremely tolerant of diversity in people and did not look for carbon copies of themselves. But they were totatly—fiendishly—intolerant when it came to a person’s performance, standards, and values. 5. They were not afraid of strength in their associates. 6. One way or another, they submitted themselves to the “mirror test” — that is, they made sure that the person they saw in the mirror in the morning was the kind of person they wanted to be, respect, and believe in. This way they fortified themselves against the leader’s greatest temptations—to do things that are popular rather than right and to do petty, mean, sleazy things. Finally, these effective leaders were not preachers; they were doers. In the mid 1920s, when I was in my final high school years, a whole spate of books on World War I and its campaigns suddenly appeared in English, French, and German. For our term project, our excellent history teacher — himself a badly wounded war veteran told each of us to pick several of these books, read them carefully, and write a major essay on our selections. When we then discussed these essays in class, one of my fellow students said, “Every one of these books says that the Great War was a war of total military incompetence. Effective leaders delegate a good many things; they have to or they drown in trivia. But they do not delegate the one thing that only they can do with excellence, the one thing that will make a difference, the one thing that will set standards, the one thing they want to be remembered for. It does not matter what kind of organization you work in; you will find opportunities to learn about leadership from all organizations — public, private, and nonprofit. Many people do not realize it, but the largest number of leadership jobs in the United States is in the nonprofit, social sector. Nearly one million nonprofit organizations are active in this country today, and they provide excellent opportunities for learning about leadership. The nonprofit sector is and has been the true growth sector in America’s society and economy. It will become increasingly important during the coming years as more and more of the tasks that government was expected to do during the last thirty or forty years will have to be taken over by community organizations, that is, by nonprofit organizations. 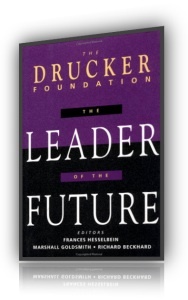 In the end, Drucker said, the essence of leadership is performance. In other words, to be a good leader means being effective, and that’s something that gets learned through repetition. 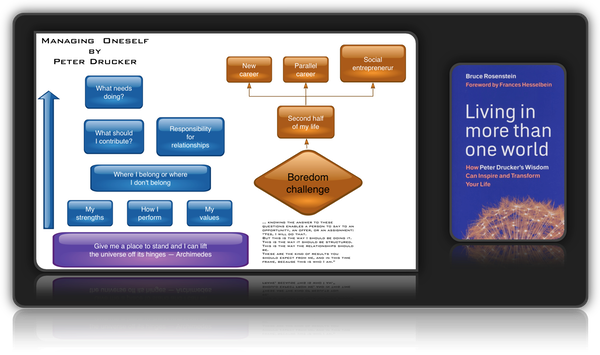 “Effectiveness … is a habit; that is, a complex of practices,” Drucker declared in The Effective Executive. “And practices can always be learned. Practices are simple, deceptively so; even a seven-year-old has no difficulty in understanding a practice. The discussion revealed an underlying worship of “leadership” and a disdain for “management.” Leaders are inspired. Leaders are large. Leaders are the kids with black leather jackets, sunglasses, and sheer unadulterated cool. Managers, well, they’re the somewhat nerdy kids, decidedly less interesting, lacking charisma. And of course, we all wanted to be leaders, and leave the drudgery of management to others. Effective leaders actually practice management and through their example lead others to do likewise. What are you going to calendarize from this page? Those who ignore this (through apathy, arrogance, or complacency) essentially support the evil doers.